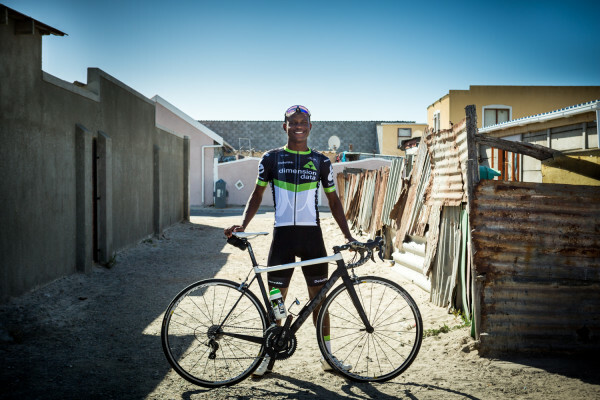 You have to want it so much more than anyone else, says Nicholas Dlamini (22), who has earned a place as a professional cyclist for Team Dimension Data for Qhubeka Continental, competing in the under-23 (U23) category. Acting as the feeder team to Team Dimension Datas World Tour outfit, the 2017 continental squad features 11 young cyclists, of whom three, including Dlamini, are South African. Hand-picked based on consistent results and promise, these riders are considered Africa's best young cycling talent today. Dlamini has big goals: success at the 2020 Olympic Games and the iconic Tour de France. And hes well on his way, getting closer with each turn of the pedal. His next step is to make Team Dimension Datas professional World Tour squad. In June, the ambitious young rider made headlines when he triumphed at the U23 Giro dItalia, earning himself the King of the Mountains (KOM) title. Last February, he placed second behind Stefan de Bod in the U23 category at the SA National Road Championships in Wellington. Happiness to me is cycling. It's brought me to where I am now, says the pedaling prodigy from Cape Town's Capricorn Park near Muizenberg, an area rife with unemployment, violence, drugs and gangsterism. He lives with his mother (for a long time the family's sole breadwinner), his twin sister and two other siblings. That's when he's not in Lucca, Italy, where the continental team is based during the cycling season, mainly following the European seasonal calendar. It was hard not having the resources I need to hone my skills but it didn't stop me. I never stopped believing in myself. It has taken and still takes guts but it's worth all the sweat and tears." He was introduced to cycling at 12, by a friend, Vuyisa Mgolombane. Soon after getting his first bicycle, a Peugeot, he linked up with a local community cycling club. After a year of training, he made the move to join the Velokhaya Life Cycling Academy, and then he was selected for the HotChillee Development Rider programme where finally he was given the opportunity to compete in formal races. In 2015, he joined Team Dimension Data as a continental U23 rider (the team was then known as Team MTN Qhubeka). Team Dimension Data is Africas first World Tour cycling team. The squad rides to raise awareness and funds for Qhubeka, a non-profit organisation that mobilises for socio-economic upliftment by distributing purpose-built bicycles to deserving South Africans. Qhubeka is an Nguni word that means to progress. With a bicycle, a person can travel faster and further, and carry more. I can definitely say Qhubeka moves people forward, says Dlamini. My own story clearly is an example. Now I'm giving back and that gives so much more meaning to my riding. Nederburg Wines in Paarl is the exclusive premium wine partner of Team Dimension Data, riding for Qhubeka. The winery is also home to Qhubekas first bicycle assembly facility in the Western Cape. Here bicycles are built for distribution to various Qhubeka-affiliated learn-to-earn, work-to-earn and disaster relief community programmes. The facility is run by master bicycle mechanics Beverley Roode and Janine Johnson of Bicycles & Beyond (BAB) on behalf of Qhubeka. It employs four women from the local Paarl East communities. Team Dimension Datas World Tour squad is currently competing in the Tour de France, now in its 104th year. The 2017 edition of this prestigious Grand Tour race started in Düsseldorf, Germany on 1 July, and concludes with the Champs-Élysées stage in Paris, France on 23 July. To view a video of Dlamini, go to https://youtu.be/NATtCdCuGUw.